What Is A Drywall Lift? When it comes to finishing a room nothing fills out walls and ceilings better or faster than drywall. This amazing building material can quickly transform studs and joists into solid surfaces ready for finishing. Since drywall comes in sheets that are 4 feet wide and 8 or 12 feet long you can cover large areas in a hurry. But hanging drywall is also known as hanging rock for a reason – those panels are not light. Half-inch drywall weighs approximately 1.6 pounds per square foot, and a panel of five-eighths drywall weighs in at about 2.3 pounds per square foot. That means a 4’x8′ sheet of 1/2″ drywall weighs just over 51 pounds, and a 4’x12′ panel of 5/8″ drywall weighs over 110 pounds. That is a lot of weight to lift and hold while you screw it in place. That is where a good drywall lift comes in handy. 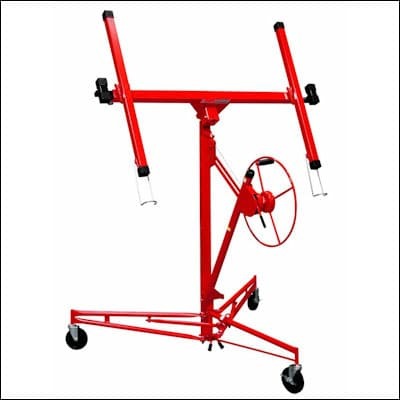 A drywall lift is a hoist that is specifically designed to hold sheets of drywall and lift them into place on walls or ceilings. These back-saving tools are relatively inexpensive, and can turn a two or three person job into one that a single worker can do with ease. Instead of requiring several people on ladders trying to simultaneously trying to lift, hold, and screw drywall into place, with a drywall lift one person can raise even a 12-foot sheet into place and secure it without worrying about hurting themselves. And it isn’t just for drywall – these lifts can also help with other wall boards, like plywood and paneling. Since they are such great time and back savers, many DIY folks look to rent a drywall lift when they have a small job to do. 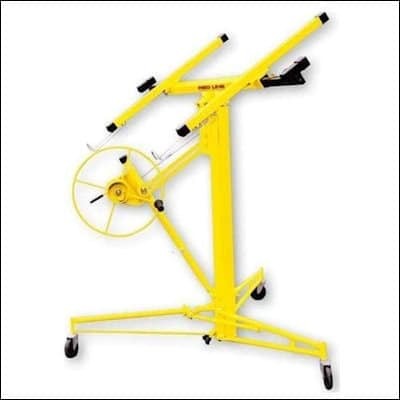 But the prices on high-quality drywall lift hoists have come down to the place where it doesn’t cost much more to buy one than it does to rent. If you own the lift you can use it at your leisure, without having to worry about picking it up and then dropping it back off at the rental company when you are done. And there is no worry about paying more if you have to keep it for an extra day or two. Click the buttons above for detailed information about each unit, or read on for our review of each of the top 5 drywall lifts. Our top choice for the best product in this review is the Troy DPH11 Professional Series Drywall & Panel Lift Hoist. As the name implies, this lift will allow you to raise either drywall or other panels up to 11 feet high for installation. An 11-foot lift gives you the reach you need to raise drywall to the upper walls and ceilings in almost any home or garage. It includes features like 5″ castor wheels, which allow it to move easily around the job site, even when loaded with a full sheet. It is made with heavy-duty steel, which gives it a 150 pound lifting capacity and ensures it will hold up for a long time. And it includes a winch brake to ensure the raised sheet stays in place while you secure it to the wall or ceiling. 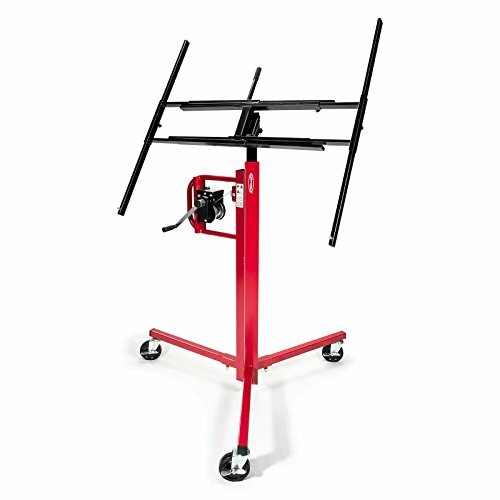 The DPH11 also includes a few additional features, like a backstop with rubberized feet that will keep the hoist from moving once the sheet is in place, and telescoping arms that allow you to lift up to a 16-foot sheet with the hoist. And they offer an optional extension kit that extends the lifting height up to 15 feet for jobs that require it. A survey of the nearly 500 online reviews of the Troy DPH11 lift show a high level of satisfaction from buyers, with nearly 90% of reviewers giving it either 4 or 5 stars. And the fact that the Troy DPH11 can be had at a great price (it is the least expensive in our roundup), make it everything you want in a drywall lift. Overall it is an excellent lift, which is why we made it our top pick. 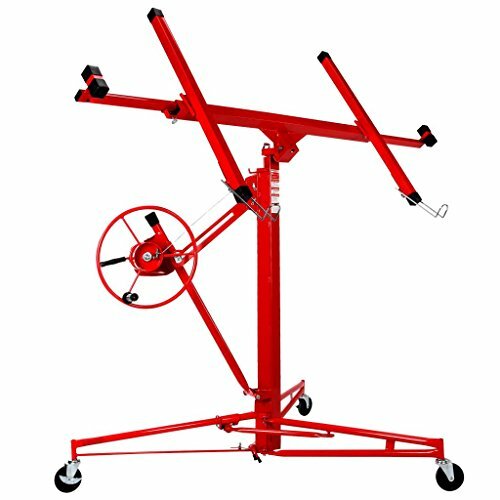 Our second choice in this roundup of drywall lift hoists is the Best Choice Products Drywall 11′ Lift Panel Hoist. The specs on this drywall lift are very similar to our top choice unit from Troy, which means it is also a quality lift. It also comes with 5-inch castors for ease of movement, and is similarly forged from heavy-duty steel for durability. It features the same height and weight capacities as the Troy lift, but doesn’t have a few of the extra touches. But despite that, it is a very capable drywall lift. People who have purchased the Best Choice lift mostly have good things to say about their experiences with it, with over 85% giving it 4 or 5 stars. A few did mention they thought it was a little wobbly, or that the castors were a little hard to steer. But overall it received very positive feedback from owners. And given the extremely competitive price, the Best Choice Products lift is a solid contender. The third item in our review of the top drywall lifts is the GypTool Drywall Lift Panel Jack Hoist. The GypTool lift is built tough, with an all-welded, heavyweight steel frame covered with an enamel finish. This combination gives the GypTool both long-lasting durability and reliable performance. While our #2 choice had a few complaints of being wobbly, the GypTool comes with a 4-foot wide tripod base and locking castors that make it very secure. It also comes with a powerful winch crank that sports an improved gear system to ensure easy lifting of sheets of drywall. The GypTool lift has nearly 200 reviews on Amazon, and an impressive 94% of them are either 4 or 5 stars, so it is a well regarded unit. But a few reviewers did mention weld issues, which is surprising given that the GypTool claims to be contractor grade. The extensive positive feedback from purchasers and reasonable price makes the GypTool Drywall Lift our #3 choice, and worth considering. POWERFUL WINCH CRANK: Contractor-grade drywall lift features a new and improved advanced gear system, providing easier lifting, positioning and installation of drywall, sheetrock and wood panels on ceilings or walls, for stress-free and efficient work. Telescoping mast allows for quick and smooth sheetrock raising/lowering, accommodating panels up to 4' x 16' in size. SUPERIOR REACH: Simply and easily hoists panels overhead, as lift features an 11' reach for flat ceilings. Large cradle extends to 7' in width, rotates 360 degrees and tilts 65 degrees forward for use on both flat and sloped ceilings. STABLE & SECURE: Cradle features auto-locking outriggers and panel support tabs to hold panels in place and the entire unit is supported by a 4' wide tripod base with anti-slip locking casters for secure mounting. 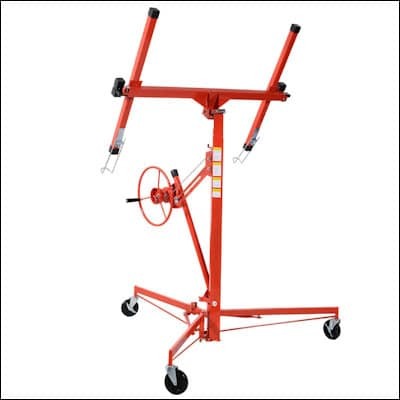 HEAVY-DUTY CONSTRUCTION: Constructed with a superior, all-welded, heavyweight steel frame and enamel finish, this lift provides long-lasting durability and reliable performance. 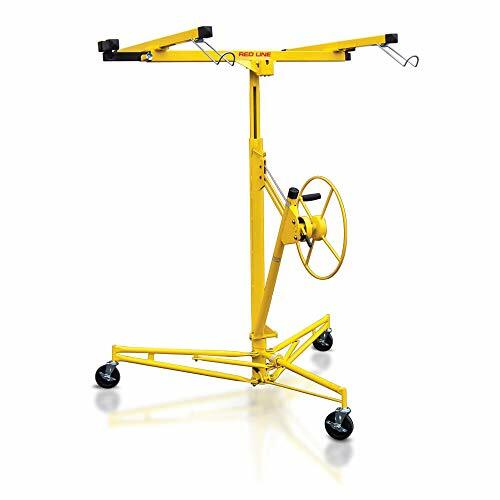 EASY TOOL-FREE SETUP: Ideally suited for busy contractors and professionals, this lift features quick, tool-free setup and disassembly convenient portability and storage. The next entry in our list of great drywall lifts is the 11AA Goplus Drywall Lift. Like other lifts in our lineup the 11AA Goplus comes with 5-inch castors, an 11-foot max reach, and 150 pounds of lifting power. Those seem to be the target levels for consumer drywall lifts, and the Goplus meets that standard. Over 80% the online reviewers of the Goplus lift gave it either 4 or 5 stars, so it obviously worked well for the majority of people who purchased it. But several reviewers mentioned warping when lifting heavier loads, so the construction quality may be a little below its peers. If you are looking for a lift for heavy use you might want to keep that in mind. The bottom line is the Goplus drywall lift checks all the right boxes when it comes to specifications, has a solid record of positive feedback from purchasers, and can be purchased one of the lowest prices in our roundup. That should be enough to put it on your shortlist. 【5" Caster Wheels】3pcs of 5'' caster wheels for easy rolling from room to room and keep balance. 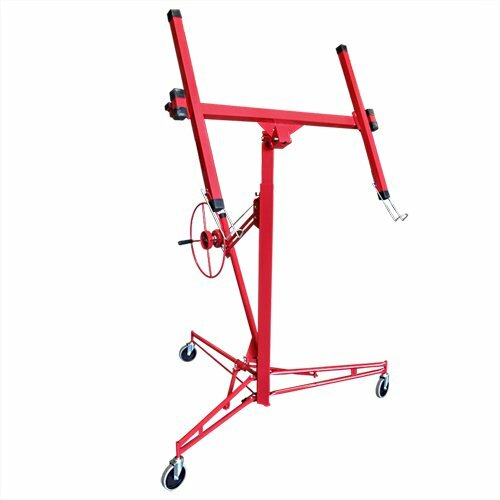 【150Lbs Load Capacity】This drywall lifter is made of heavy duty steel which ensures its long life span. Its load capacity is about 150 lbs. 【Built-In Winch with Brake】Lifter is easy to assemble and disassemble. The lock device and built-in winch brake are included, which guaranteed its safety and sturdiness. 【Hoist Up on Walls or Ceilings】Ideal for installing 4' x 16' sheets, can be hoisted up on walls or ceilings, time saving and labor saving. 【Both Home and Commercial Use】Perfect for both home & commercial use. The final lift in our review of the best drywall lifts is the Red Line Professional Drywall Lift. Like the other units above the Red Line lift features 5-inch castors, an 11-foot max height, and a 150-pound lifting capacity. But there are a few details on the Red Line that make it stand out. The Red Line hoist tilts a full 65° horizontally to let you easily load sheets and put them into place, as well as tilting 10° longitudinally for maximum placement flexibility. This indicates the Red Line Professional has been designed with ease of use in mind. The base legs also point towards superior design, as they have been specifically placed to allow the unit to roll through narrow doorways. And the Red Line Professional can be assembled and taken apart without tools, in under a minute. That is a great feature that shows the Red Line was built with the end user in mind. The reason the Red Line falls at the bottom of our list are some concerns raised by online reviewers. While nearly 90% of them gave the unit 4 or 5 stars, there were several that mentioned the lift breaking during use – perhaps from poor welds. Those questions, in conjunction with a price towards the higher end of our range, pushed the Red Line Professional down in our roundup. Panel Dolly – A drywall panel dolly is a small wheeled device that allows you to roll a few sheets of sheet rock easily from one location to another. This simple little tool will save you a ton of lifting and carrying as you move sheets of drywall around your project site. 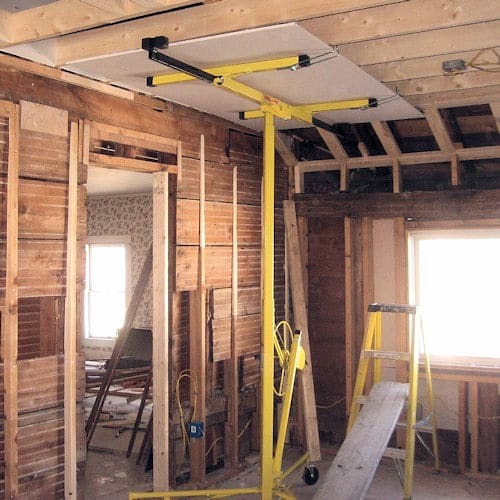 Panel Lifter – A panel lifter is a plastic tool that will allow you to lift a full sheet of sheetrock while taking the strain off your upper body and arms. To use one you just hook it around the bottom of the sheet in the center, tip the panel, and lift it leaving your arm extended. 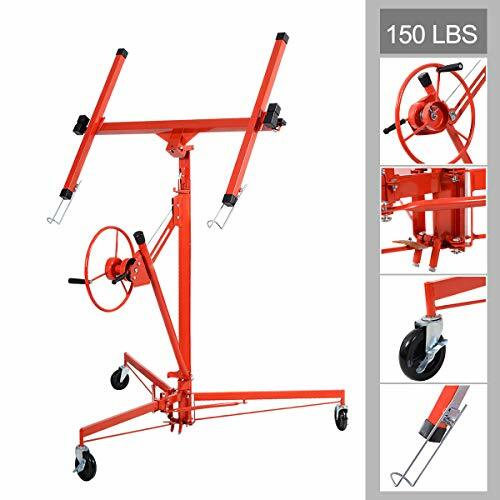 You will be surprised at how much easier it makes it to lift and move sheets of drywall. Roll Lifter – A roll lifter is a handy little tool that helps you lift a sheet up off the floor with your foot while you attach it to the studs. Sometimes called a kicker, it is just a simple lever designed specifically for raising sheetrock an inch or so while you screw it into place.